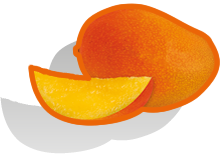 measures between 7 and 12 cm and weighs between 300 g to 500 g. Variable, but generally oval and rounded, Mango has a large nucleus in the center. Its skin is smooth, sometimes shiny or matt, a mixture of green, yellow, red. Its flesh is deep yellow. This Mango is fleshy, tasty and refreshing. Its taste is exceptionally mild, very aromatic, warm and reminiscent of the tropics.